Harley-Davidson was caught in the middle of President Trump's trade war with the European Union. Harley-Davidson announces it will shift some production overseas after the European Union retaliated to President Donald Trump’s steel and aluminum tariffs with a 31% tariff on imported bikes. In its Securities and Exchange Commission filing, Harley-Davidson says raising costs on U.S.-exported bikes would hurt its sales in Europe, its second-largest market after the U.S. According to the filing, the tariffs would force the company to raise costs on U.S.-exported bikes by about $2,200. Sen. Ron Johnson (R-WI) laments the U.S. trade policies that led to Harley-Davidson’s outsourcing. The company is based in Johnson’s home state of Wisconsin. Trump tweets he will tax Harley-Davidson "like never before." The president also alleges the company was using the tariffs as an excuse to "move much of their plant operations in Kansas City, Missouri, to Thailand." But with slipping sales, analysts say Harley-Davidson had few other options. Previously, the company had an amicable relationship with Trump, who singled it out as a U.S. manufacturer. Union leaders warn outsourcing production could dent its reputation as an iconic American brand. The Wall Street Journal reports Dave Cotteleer, VP of U.S. sales at Harley-Davidson, issued memos to dealers defending the company’s plans. In one memo, Cotteleer says the company isn’t moving Kansas City production to Thailand, but consolidating it in York, Pennsylvania. A spokesperson tells WSJ Harley-Davidson would only sell U.S.-made motorcycles in this country. A spokesperson tells PRWeek via email the company isn’t providing any interviews at the time, but "engaging media to reinforce and reiterate the messages within our public 8-K filing." Harley-Davidson refutes a quote falsely attributed to CEO Matt Levatich in which he calls Trump a "moron." Johnson strongly criticizes Trump’s trade policies and attacks on Harley-Davidson in an interview with radio host Dan O’Donnell. "I’m highly concerned with where the president is on this and I don’t think he should be attacking a company that’s just trying to do right by its employees and shareholders," he says. In an interview with Fox News, Trump fires more shots at Harley-Davidson. "Harley is an American bike," he says. "It’s an American motorcycle, and they should build them in this country." Trump lashes out at the company in another tweet. "Now that Harley-Davidson is moving part of its operation out of the U.S., my administration is working with other motorcycle companies that want to move into the U.S.," he says. Trump’s feuds with corporations are well-documented, and Harley-Davidson learned from them: Communicate with financials. Less is more. 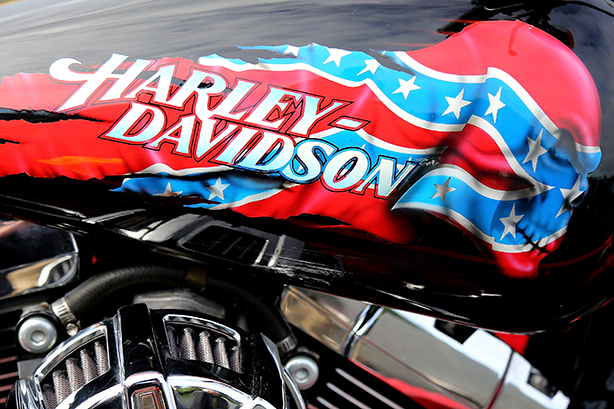 Harley-Davidson’s political battles shouldn’t handicap its internal comms. If your workers are scared they’ll lose their jobs, talk to them. Not adding a face to its press release was a tone-deaf mistake. If you have a financial story, such as being forced to raise costs on exports, tell it. Make sure there aren’t any surprises waiting.